Beautiful 18th century farmhouse and 18th century flint cottage. Both provided with bbq's and garden furniture for alfresco meals. 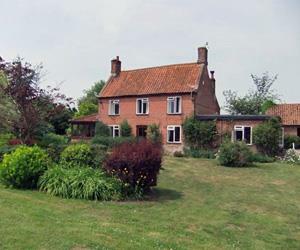 Centrally located for North Norfolk Coast, Norwich or the Norfolk Broads. Village pub is 1 mile, other amenities 6 miles. Detailed brochure open all year. Facilities for children: Little Flint has enclosed garden Children welcome from any age. Turn off A47 into Crown Lane. Drive 1 mile down lane until seeing dairy sign on tree. Situated 500yds further to right is Lyons Green. From Downham Market railway station. Take the A1122 to Swaffham. Then A47 towards Norwich. Little Fransham is 6 miles from Swaffham.